Keep in mind that hedgehogs are natural hunters. Their instinct is to hold on until what they have bitten is still. Do not attempt to shake off your hedgehog (or other small critters). Regardless of your behavior modification preference, should your hedgehog actually latch on to your skin, pulling away might encourage your hedgehog to grip tighter. Hedgehog enthusiasts tend to disagree on the best method to stop a bite. What one person might consider safe and effective another might view as cruel. One safe and simple way to encourage your hedgehog to release a bite is to gently cover both nostrils. The hedgehog will release its bite so it can take a breath. Another option is to try pushing your finger toward your hedgehog. This tends to cause your hedgehog discomfort, and it will subsequently release your flesh. Be cautious with tapping the hedgehog on the back while it has a grip on you. As indicated by Small Animal Channel expert Jill Warnick, tapping may make your hedgehog even huffier around you. One method of getting a hedgehog to release a bite is to simply scream like the dickens when it bites you. This startle technique tells the biter know to expect a negative reaction when it bites. It is also a good healthy way for you to relieve your stress! Some hedgehogs respond very well to sound as a negative response when they bite. A loud “No” or even a scream of pain each time the hedgehog bites could be enough to dissuade biting. Some hedgehogs may like the loud response, and for these hedgehogs it is best to make no noise at all. My personal way to get them to stop biting is the scream like a cheerleader method. In essence, you want to make biting you a negative experience for BOTH of you. And quite frankly, hollering like I’m on fire when I’m being bitten comes very naturally to me. So it freaks out the hedgehog, who stops biting. And it negatively incense them from biting again. Truth be told, that method works pretty darn well. One of the most common and quickest methods of getting a hedgehog to release its grip is to blow a quick puff of air directly up the hedgehog’s nose. It won’t hurt your hedgehog but may startle it enough to let go. This method of behavior modification to prevent further biting requires owner attentiveness and persistence. You must carefully observe your hedgehog for any sign that it’s going to bite. Quickly blow a puff of air on the hedgehog’s nose as soon as it opens its mouth to bite. The puff of air will startle the hedgehog, and it will pull its forehead quills down over its head, which will stop the biting attempt. 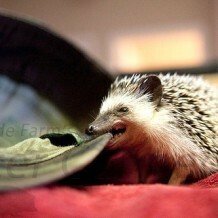 It may take several startling attempts for your hedgehog to learn that biting is not acceptable. Some breeders recommend not doing this because it could cause the hedgehog to clamp down tighter, or make an irritated hedgehog more irritated or a shy hedgehog even more fearful. Some find that a splash of water or a quick dash under running water will shock the hedgehog into releasing. Of course, you will need to ensure that your hedgehog is properly dry before retuning it to its cage. Some hedgehogs are persistent biters and may respond to this more assertive behavior modification technique when other methods have failed. This practice is somewhat controversial among breeders and owners because of the its aggressive nature. This method requires you to keep a Q-tip dipped in rubbing alcohol nearby. When the hedgehog bites, touch the hedgehog just above its nose with the Q-tip. The unpleasant smell will hopefully discourage your hedgehog from biting. Please avoid the actual tip of the nose as hedgehogs have very sensitive nasal passages that should not be unnecessarily irritated. This method is considered a failure if four to five applications of alcohol to the nose do not stop the hedgehog from biting. Some enthusiasts believe the alcohol method is cumbersome and may cause more aggravation than it is worth.